Whether it’s a day trip or multi day tours, we will introduce you to the history, nature, wildlife, crafts and food and drink of Orkney. We offer small group tours with a personal touch, our experienced driver guides will take you on an unforgettable journey along scenic coastal and country roads to the Heart of Neolithic Orkney, Viking settlements and Wartime History. We have included a page titled Orkney Tours which will give you an idea of what we offer. If you have a wish list for your visit, we will work with you to create a tailor made tour. There is something for everyone in Orkney. To find out more about who you will meet, what there is to do in Orkney and how to contact us, please continue to browse our website. 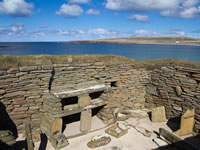 Northern Europe’s best-preserved Neolithic village consisting of ten houses, part of the Heart of Neolithic Orkney. 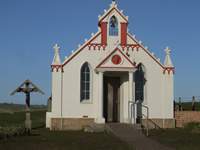 The Italian Chapel is a Catholic chapel on Lamb Holm in Orkney, built by Italian PoW's during WWII during the construction of the Churchill Barriers. 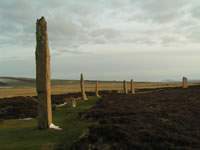 Stone circle on the Mainland of Orkney, UNESCO World Heritage Site. 104 meters in diameter, originally composed of 60 stones. 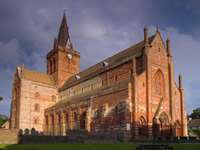 The most northerly cathedral in the British Isles, built when the islands were ruled by the Norse Earls of Orkney. Construction started in 1137, and added to over the next 300 years!